Summary: We like to walk loops and found many one way hikes in the Lake District, so fashioned this 8.6 mile loop out of 3 smaller one way walking trails, joined together. The walk provides great views after moderate ascents. 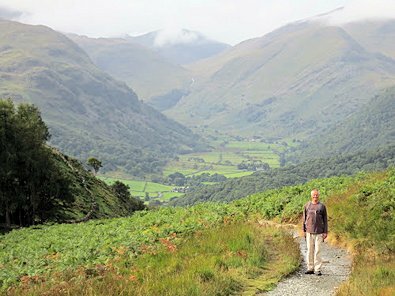 We started with a trail in perfect walking conditions from behind High Lodore Farm, which is on the Borrowdale Road , next to the Borrowdale Hotel, about 4 miles south of Keswick. An alternative start for motorists can be from any village on the route. The walk is kindly contributed by Di and Hans Carlen. At the back of High Lodore Farm is a gate and rocky path with switch backs up the ridge behind the farm, heading west into Watendlath Valley. This was a bit of a challenge first up with a steep rocky climb to the saddle of the ridge and a small descent at the beck with some falls on your left. We stopped here to admire the beck and mossy forest and get our breath back. Some instructions we read suggested we should be on the other side of the falls. This seemed wrong. Do not cross the falls, we kept the Beck on our left and continued up the windy path through a small gate and a gap in the crags to our right. About a half mile later we came to a wooden footbridge at the start of the Watendlath Valley. This hike has a unique directional marker at a 3-way junction - a metal triangle in the ground. We went right towards Watendlath (south/south east), not over the bridge. 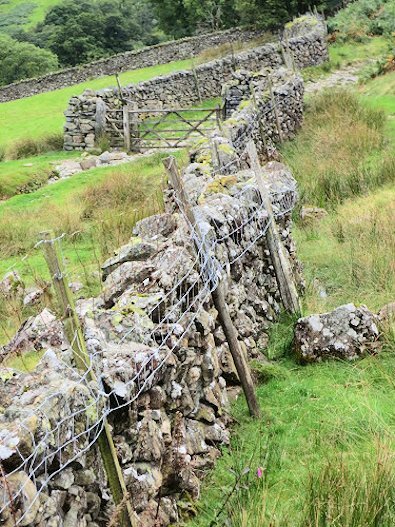 The walk passes through several gates (in a variety of forms) and skirts the right hand side of a stone wall as it climbs further into the valley. This section can be a little boggy after rain but we did not find any of it difficult. On the way to Watendlath it was relatively easy walking as the climb is very gradual. The hamlet of Watendlath is on the other side of some small falls and the Beck. Not much activity in town but a nice spot to stop for a break anyway. Keep to the path on the right and shortly you reach Watendlath Tarn, which appears to feed the Beck, which flows well after rain. 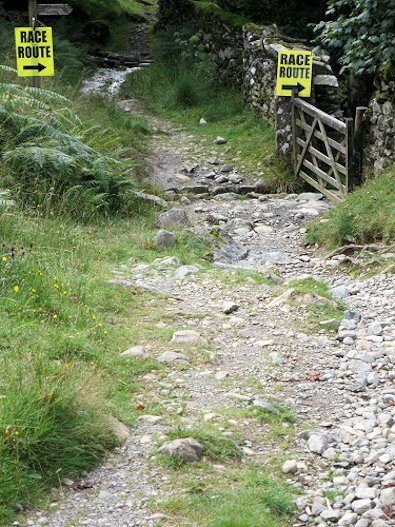 Keeping the tarn to our left, we followed the signs uphill towards Borrowdale Valley and Rosthwaite village. The path is a bit rocky but again not too hard walking. It was up up up again for a while, about 400 feet until we reached the top and then of course it was down down to Rosthwaite village. 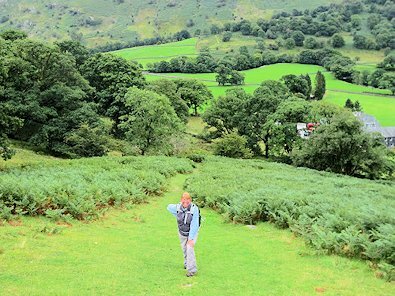 We were heading to Rosthwaite but we took our time, as it was a steep rocky track. Walking poles would have helped but we managed without (Di having broken hers after a previous walk). The trail down is obvious but there are various farm gates and footpath signs pointing right. Ignore the first few. Only follow signs that say Rosthwaite (we made this mistake and took a small detour). When you see the Rosthwaite sign go right through the gate and follow this path down to the village. It can be a little muddy after rain. We were interested to see that a mountain bike event intended to follow this path, we had not see one bike and it appeared to us to be a tough course. When we came to a minor road we turned right, went over the bridge and were back on Borrowdale Road. This was the end of the first section of the walk and was about 3 miles long. 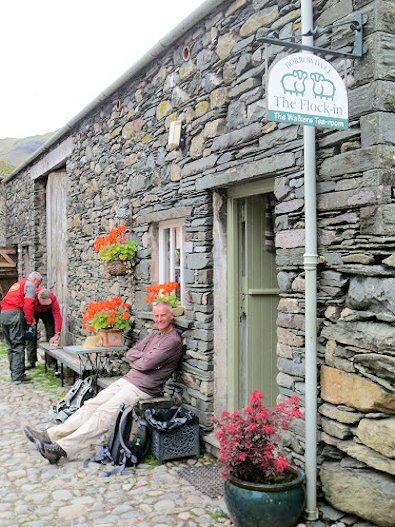 Cross Borrowdale Road, turn right into Rosthwaite village and head towards The Flock in Walkers Tea Room. We took a break here for a cuppa as we enjoyed the luxury of a hot drink mid walk. Section 2 of the walk for us left the Flock in Walkers Tea Room and headed along the road immediately opposite. About 100 metres (150 yards) along there is a tin shed on your right with a footpath running bedside it which heads to Longthwaite YHA. We followed these signs through a paddock, out the other side and turn right once you reach some whitewashed houses. 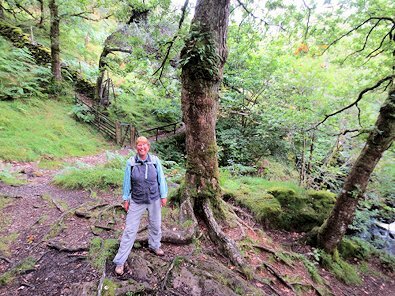 The walk continues south west, near the River Derwent and literally past the front door of Borrowdale YHA and into Johnny's Wood. 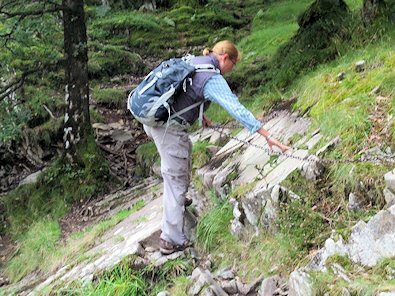 All easy going until the track gets a bit narrow and rocky and a little scrambling is required. Fortunately, chains were supplied for hand holding...but only on the first section. Then you are on your own. When you see a large wooden building and sheds on your left, go right though the kissing gate and immediately left along the path and walk a few hundred metres (yards) towards Seatoller. Soon you should see a farmers gravel trail heading uphill to your right. Follow this uphill northwards. We took a short cut straight up hill, towards 3 conifer pine trees. Better not! What appeared to be a small path was very overgrown with ferns and the became slick wet grass and quite steep. 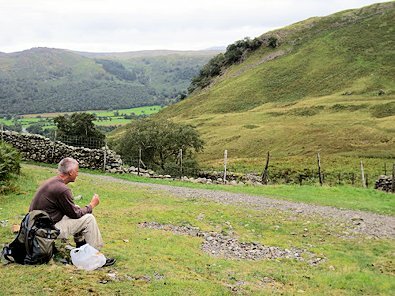 At the top you should be on a gravel track on the Borrowdale Terrace and you continue to follow the path uphill where you come to some stone walls and gates. Go through the gates continuing uphill but taking paths towards the right (not hard right as this will take you downhill again - another small detour we took...) There appear to be lots of trails at this point. Don't worry, you won't get lost. 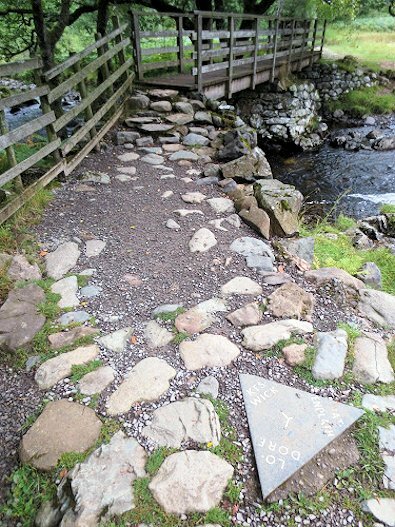 Keep your ascended height and head westwards until you see a well walked gravel trail heading almost due north, parallel to the Borrowdale Road or River Derwent, but about 600 feet above them on the western side. The trails eventually come together at the main trail from Seatoller to Castle Crag. We took a short break here, after crossing a footbridge over a small stream. Very nice and here we met another couple doing picnic lunch. 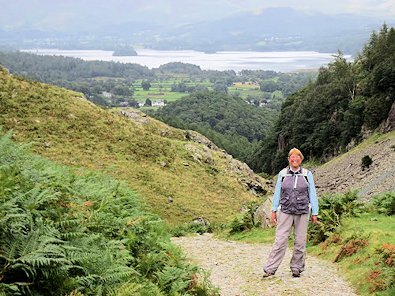 Section 3 of the walk is the Seatoller/Castle Crag trail which is very popular and well published and hence more travelled. You will meet other walkers here, we did meet quite a few, even on the Friday we walked it. 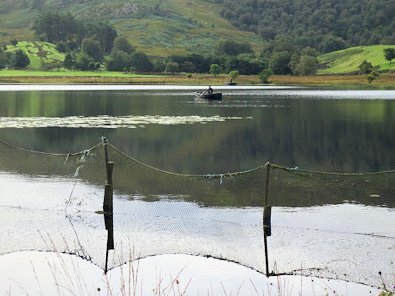 We continued northwards and found Castle Crag on our right. You can add a small detour here to climb Castle Crag for the unimpeded views. 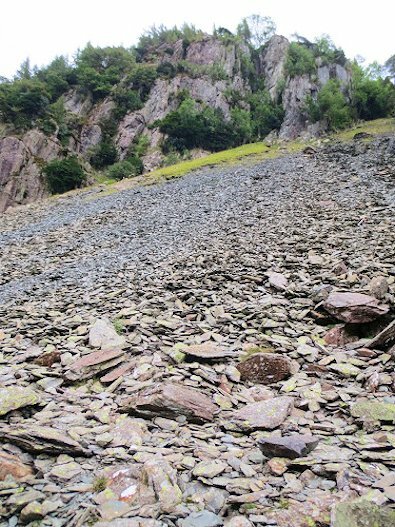 You don't have to climb this scree, as in the photo, there are some small obvious paths. The main trail at this point is the old Quarry toll road which is a less steep slope, stable underfoot with big rocks embedded into the ground and easy to follow. 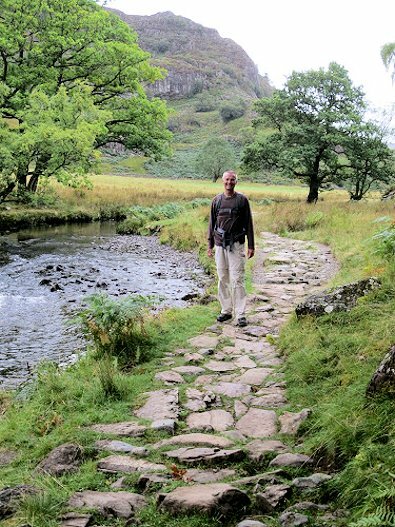 Most people come up this way just to Castle Crag and return. Then we were on the homeward stretch, down the old toll road towards Derwent Water that is visible from this height and the hamlet of Grange. The path eventually reaches a minor road, turn right and walk about 1/3 mile into Grange. Some lovely tea rooms here make a good spot for a late lunch or afternoon tea. 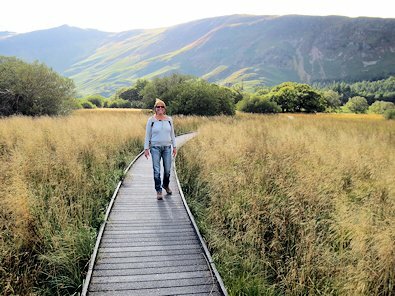 This walk finishes by crossing the old stone bridge, and turning left on the Borrowdale Road (we used the footpath beside it) to walk back about 600 metres back to High Lodore Farm. A nice variation here (with less road walking) is to follow signs to Manesty - which is to turn left when you reach the minor road rather than right towards Grange. We did this section as part of another walk. Follow the road for about a half mile, slightly uphill, and you will see a gate and footpath signs to your right towards Keswick and Lodore Go through the gate and follow the obvious path for about 1 mile until it reaches a broader gravel path and forks left and right. Turn right onto the "duck boards" (boardwalk over marshes) and follow these to a metal footbridge over River Derwent. The path brings you to a gate at Borrowdale Road, and just north (about 1/4 mile) of High Lodore Farm. Turn right and finish your walk back at the farm.